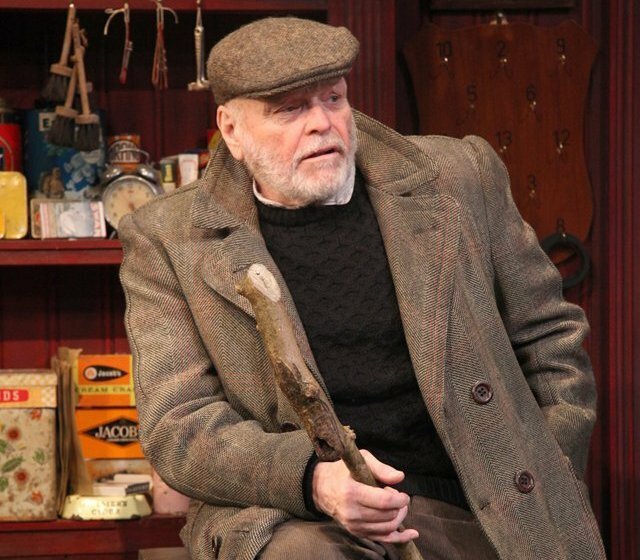 Tony-winning actor Bryan Dennehy trades in Eugene O’Neill and Broadway for John B Keane and the Olympia and the results are impressive. Dennehy’s accent hits American at times of stress in the first act, and occasionally makes inexplicable sorties to Belfast, but for the most part, and crucially during his lengthy scene with Tadhg in the second act, it’s securely stowed in Munster. The omerta which his action imposes on the village fails to be broken by the powerful condemnatory speech by the Bishop. This seems to find expression in the complicated set. A facade lowers down in front of the very solid interior of the pub, which rushes forth to fill the stage after an initial glimpse of the titular field. This shop-front then pulls up as we dive into the machinations occurring in this pub/auctioneers. More than once as characters walk past the shop-front and its unheard conversations it seems that primal familial secrets of the pub can never find expression in the outside world of church and law. Dennehy carries the tragedy while around him the supporting cast Fassbender for all their worth, almost as if the only sane response to the presence of such darkness in a small closed community is black humour. The comedy of the work is more apparent than usual, witness the magnificent shrug given by publican/auctioneer Mick Flanagan (Bosco Hogan) at one point. Derbhle Crotty (so good in The Silver Tassie) in particular makes the long-suffering Mamie Flanagan more of a jester than normal, satirising the alpha-males around her. All this unexpected levity only counterpoints the Bull’s desperation, and the germ of truth in what he says. As he justifies himself by demagoguery against the priest and garda you can see what enticed Dowling and Dennehy here for this play. Irish people may not live on the land anymore, but many of them do feel that there is one law for the establishment and another for everyone else. In synching in with David McWilliams’ insider/outsider analysis of our current woes Keane’s 1965 play is made startlingly of our times…. The Field continues its run at the Olympia Theatre until February 13th.